Flower Growing In Wymondham, Norwich, Norfolk. Cut Flower Workshops & Advice. Pressed Flower Pictures & Gifts. The cutting garden is coming on nicely and the beds are filling up. I've planted out all of the hardy annuals now and they are getting bigger by the day. Every morning, my husband Jamie and I take a cup of tea and have a walk around the garden to see what has come into flower and every day there is something new to see. The whole garden has been planted with cutting in mind and this year should be the best year yet as the garden borders have matured and our recent revamp of the cutting beds has provided more space. Buds are forming on the new shrub roses that we put in, we've harvested all the tulips and have been picking Forget-me-nots, Bluebells, Honesty, Ranunculus, Euphorbia, Perennial wallflowers, Aquilegia and Telima to bring into the house. Now the weather has been warming up and the risk of frost is very low, I'll be planting out the frost tender half-hardy annuals to finish filling the cutting beds. I can't wait until next month when the first annuals will be ready to pick - watch this space or check out my Facebook, Instagram and Twitter pages for photos of all the flowers I've picked this year as well as information on 'Grow Your Own Flowers' workshops running this year. A lot has been going on in the cutting garden since we finished our revamp last month. We've been planting up the beds with a mix of perennials, bulbs and roses leaving space for plenty of annuals - these have been grown from seed and are currently jostling for space in the potting shed and on my sunny windowsills until the weather warms up a bit. We started by planting up the edges of all the individual cutting beds with small, low-growing perennials and bulbs. 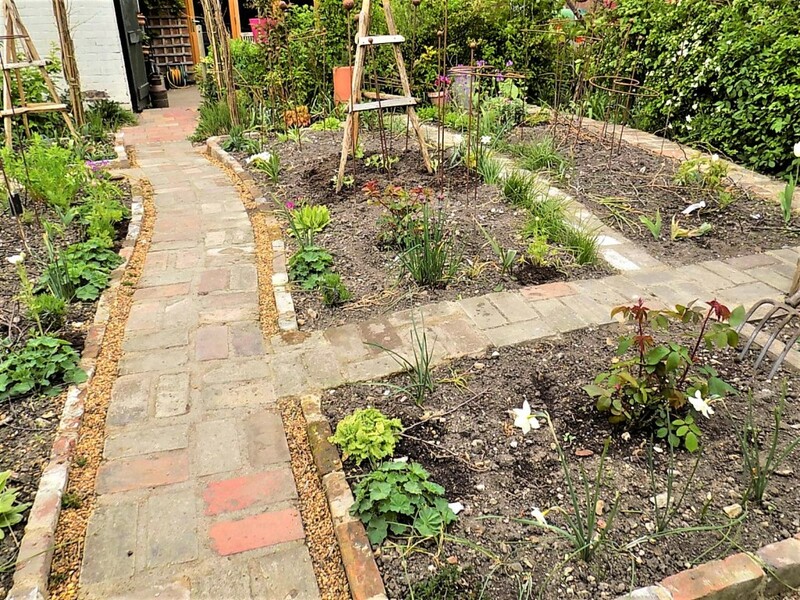 This gives the beds some structure and by restricting these plants to the edges, we still have plenty of space for lots of plants within the beds. We've chosen to line the central path with a mix of Lady's Mantle (Alchemilla mollis) whose acid-green, frothy flowers make a great back-drop for showier flowers, Lavender 'Munstead' a dwarf lavender, and a range of Primulas - drumstick primulas (P. denticulata), Primula 'Gold Lace Dark Red' and Primula cortusoides 'Primadiente' (Siberian primrose) an alpine with dainty pink blooms. Primulas are great for providing early flowers for picking alongside spring bulbs. They form small mounds that are ideal for edging beds. 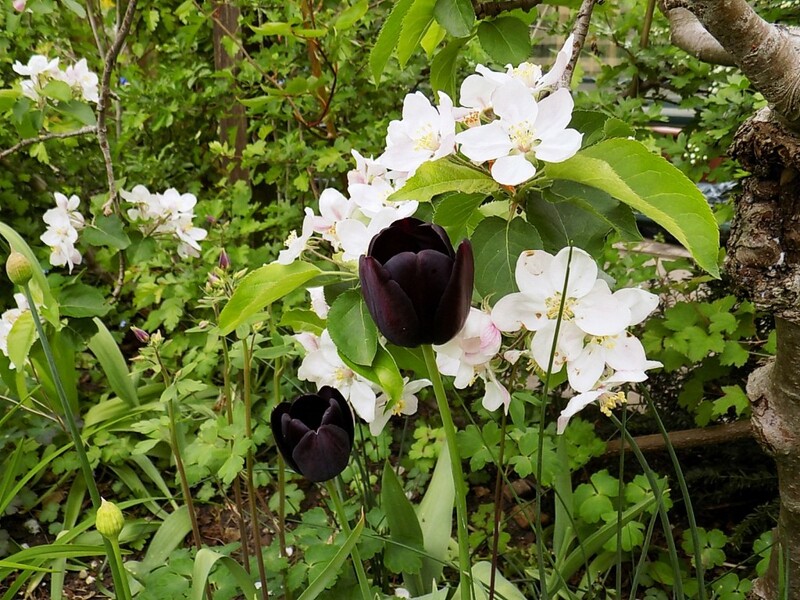 We've interspersed these with the bulbs of Iris reticulata, Tulipa turkestanica, Ranunculus, Triteleia and dwarf daffodils. 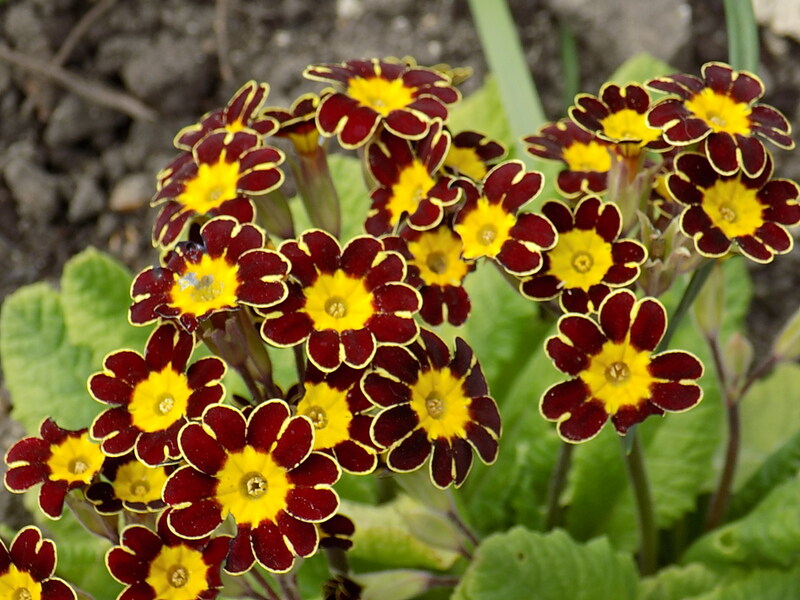 All these spring bulbs have small or strappy foliage and so are ideal for edging cutting beds. Lots of large, untidy foliage can get in the way when you want to plant annuals within the bed. With all bulbs, you need to let the foliage die down naturally so that energy goes into the bulb for next year's flowers so you do have to consider this when planting bulbs in cutting beds. So far, we've planted three different shrub roses. 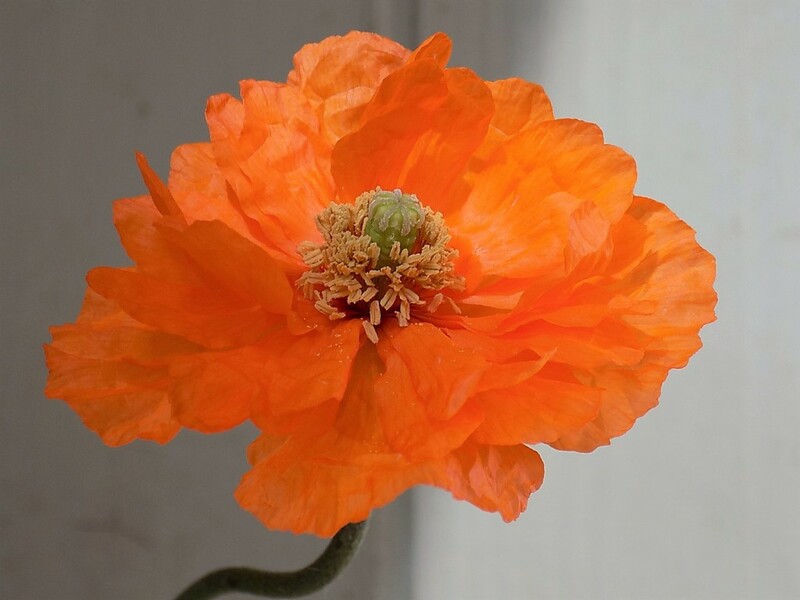 We've gone for varieties that have beautiful flowers but also have other important attributes: i) high resistance to disease, ii) must be repeat flowering varieties so that we have flowers to pick throughout the summer and iii) must have a strong scent. We've chosen 'Munstead Wood' with sumptuous, deep velvety crimson blooms and a strong Old Rose fragrance, 'Gertrude Jekyll', twice voted the nation's favourite rose, with beautiful, rich pink rosettes and superb fragrance and 'Comte de Chambord', warm pink, full-petalled flowers, opening flat with a delicious Damask fragrance. The perennial bed has been planted up with Hellebores, Salvias, Achillea, Poppies 'Patty's Plum' & Pavaper rupifragum 'Orange Feathers', Briza media 'Limouzi', a grass with delicate flower heads, and Guara, all interspersed with self-sown Nigella seedlings which have been carefully transplanted from the old raised beds. Another bed houses plants especially valuable for their foliage or for their small flowers that act as fillers (a backdrop for larger, showier flowers) - Euphorbia oblongata, Dill and some Autumn-sown Ammi majus. We've added 2 chestnut pyramids supports for the sweet peas to clamber up, incorporating manure into the soil as these plants are hungry for nutrients. Honesty and Stocks are both in flower and the Sweet Williams are just forming flower spikes. These biennials were planted out last September into our old raised beds and have been carefully transplanted into their new positions in the new beds. 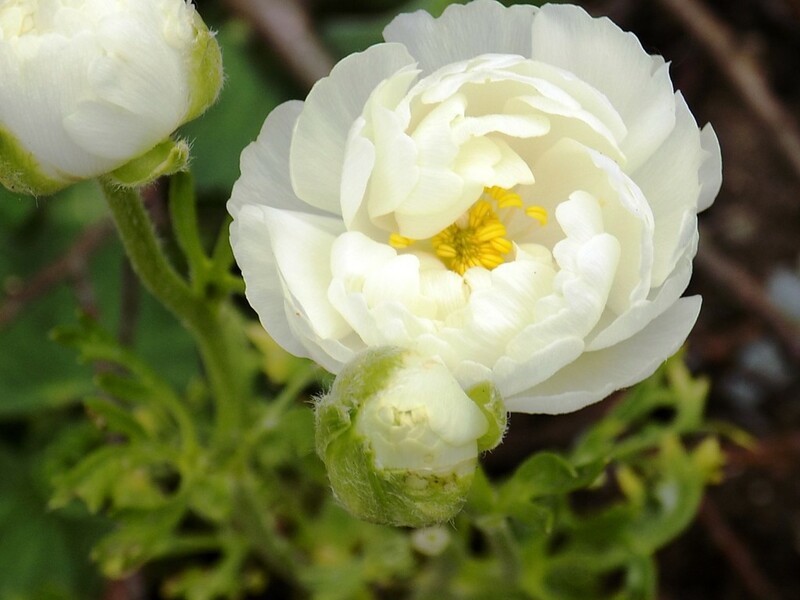 These plants are valuable for providing flowers before the annual flowers appear and after the tulips and spring bulbs are over. 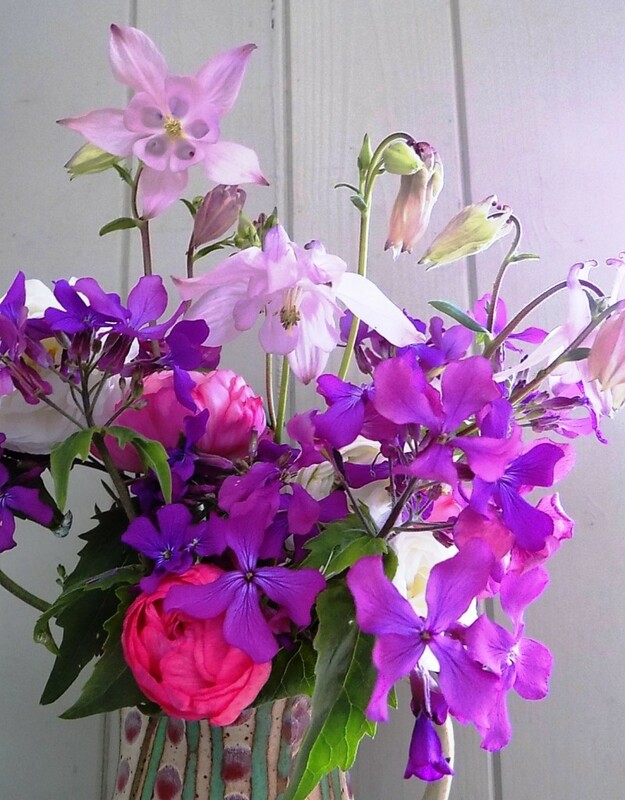 Others you could try are Sweet Rocket and Wallflowers. Sow seed for these biennials in June for flowers the following year. The tulips have been about 3 weeks earlier in flower than this time last year. 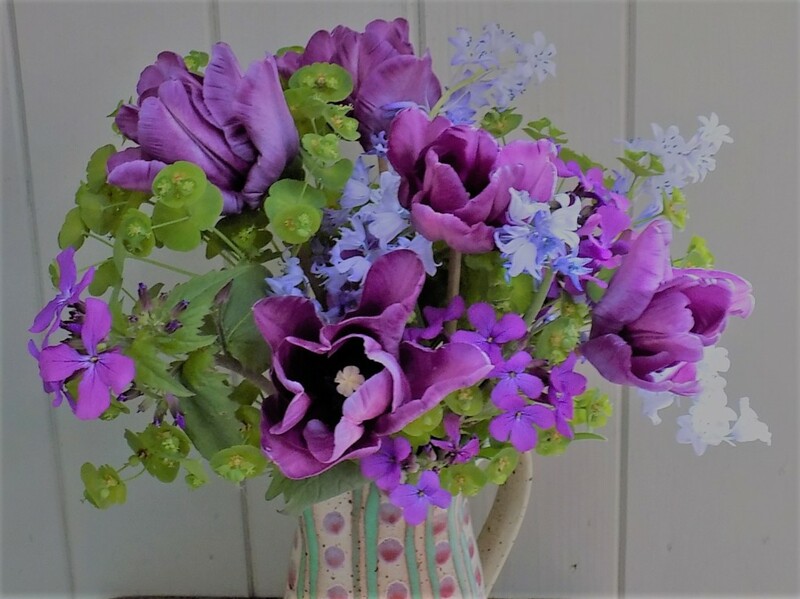 Usually, by choosing a mix of early, mid and late-flowering types, you can be picking tulips until the end of May but we may struggle to get past the first week of May! I've planted tulips in the beds where we will either be growing Dahlias or later flowering annuals like Zinnias so that the tulip foliage has time to die down before these plants get going. Scabiosa 'Fata Morgana', Orlaya grandiflora, Larkspur 'Giant Imperial Mixed', Nigella 'Black Pod', Helipterum roseum 'Pierrot', Calendula 'Snow Princess', Cornflowers, Antirrhinum 'Royal Bride', Zinnia 'Yoga', Zinnia 'Pale Mix', Limonium sinuatum 'Iceberg', Maurandia wislizensis 'Red Dragon', Helichrysum bracteatum Scarlet, Moluccella laevis, Clarkia purpurea 'Burgundy Wine', Cosmos 'Rubenza', Cosmos 'Purity' and Acroclinum 'Double Giant Flowered Mix'.